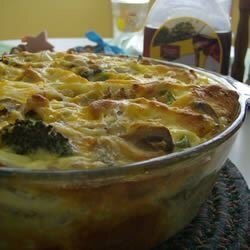 "This strata makes breakfast less hectic because all the prep work is done the night before. The quantities of mushrooms, onions, and green peppers can be varied to suit the tastes of those who will be eating this dish." Grease a 9x13 inch baking dish. Layer half of the torn bread in the bottom of the dish. Sprinkle the mushrooms and green bell pepper evenly over the bread layer. Sprinkle with half of the cheese. Top with remaining bread pieces, then layer with the onion and ham. Sprinkle with remaining cheese. Whisk together eggs and milk; pour over the entire pan. Cover with aluminum foil, and refrigerate for 12 to 24 hours. Bake covered for 35 minutes, then remove foil and bake for an additional 15 minutes, or until top is evenly brown. A savory strata with ham, mushrooms, peppers, and melted Cheddar. You may substitute cooked bacon or sausage for the ham, if you prefer.